History tells us Karl was a brilliant engineer, but he was known as a perfectionist and wasn’t much of a marketer. He tried to show off his invention in public one time, but the driver crashed into a wall. Not a great first impression. So, Karl went back to the workshop to work out the bugs. He test drove it around the workshop, but he had never driven it from point A to point B.
Bertha pretty much became a Corvette widow 65 years before the Corvette. She decided to do what so many annoyed wives after her would do: she packed up the car, took the kids, and went to her mother’s. 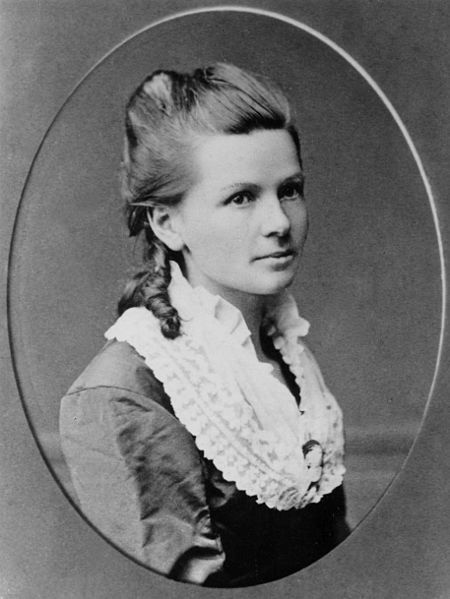 She set out in August 1888 (some sources say it was the 5th, others the 12th of the month) with her two sons: 13-year-old Richard and 15-year-old Eugen. They left Mannheim Germany at 5 in the morning and arrived in Pforzheim, about 60 miles away, 12 hours later. Problems come up on even the best roadtrips. When you’re driving the world’s first gas-powered car, they’re even more likely. Bertha had to deal with a number of setbacks on the trip. The first was the matter of filling up. The gas station hadn’t been invented yet, but Bertha wasn’t going to let that stop her. Karl’s engine ran on a type of petroleum coincidentally known as benzine (or ligroin). Benzine was available as a cleaning solvent at pharmacies. According to Wired, she would have had to stop every 15 to 20 miles for fuel (as well as water, since the cooling system tended to boil it off). The first stop was at a pharmacy in Wiesloch, which Daimler calls the world’s first gas station. She also had to unclog a fuel line with her hat pin, and insulate a shorted ignition wire with her garter. She then stopped to have a shoemaker add leather to the car’s brake shoes, effectively inventing break liners. One problem Bertha just couldn’t seem to fix on that trip was that the car wasn’t very good at climbing hills. Bertha and the boys had to get out and push it uphill. Bertha, after she returned home, later convinced Karl to add another gear to the transmission for hill climbing. All those setbacks helped improve the car, leading Daimler to call Bertha the first automotive quality manager. The trip also proved that the car could (with a just a little more work) be a viable mode of transportation. Bertha’s trip turned out to be great for publicity. Karl exhibited his car a month later in Munich. Not long afterwards, Karl started getting orders for cars. Bertha’s trip has been commemorated a number of different ways. She was inducted into the Automotive Hall of Fame in 2016. There’s also a monument in Pforzheim, with a design based on the Motorwagen. The European Route for Industrial Heritage marked Bertha’s route with signs and the route has been used by auto clubs for commemorative drives. It’s took a great lady to get Benz in the right track.